Spring is on it’s way so brush off your lightweight trench or your summer-weight Rab and get ready for the great outdoors. These March events across the UK are full of the promise of elongating days and sunshine – gearing you up for the great British summer. If, like me, you loved reading as a kid but hated English literature at school, festivals about great storytelling are an eye-opener. With more than a pinch of well known faces smattering the promotional hoardings and flyers, you’ll appreciate that this is an access for all event. Overcome the academic stereotype and indulge in one of your favourite pastimes. From first hand reasoning for authorship to hot tips on the real best sellers for your bookshelf, you’ll be like a kid in a candy book store. The glorious setting of York’s ancient streets and the city’s warm hospitality make for a thriving March event. In celebration of our days becoming at least as long as our nights, the light festival in the surroundings of Perrygrove Railway is a delight for all ages. The Gloucestershire woodland will be illuminated and trains will be running in the dark – choo, choo! But this isn’t any steam railway day out… Your tickets last all day and you can ride the trains as many times as you like! (We appreciate that may sound better now than the reality of train loops with an indignant toddler). For rainy days there’s an indoor village and for the adventurous there’s a treetop tour. Off you go then! Get your groove on in the bright lights of the south west’s most hip and happening city. The music scene in Bristol is not to be scoffed at, whatever your taste in music, but the jazz and blues event in March will leave you longing to shimmy. From swing to funk, soul to rock ‘n’ roll, with headliners like Macy Gray you’ll be shakin’ your thang all night long. Across the weekend, the Folk House houses workshops for budding or established musicians to practice with and learn from some of the most talented jazz and blues artists. Yes, you read that correctly. 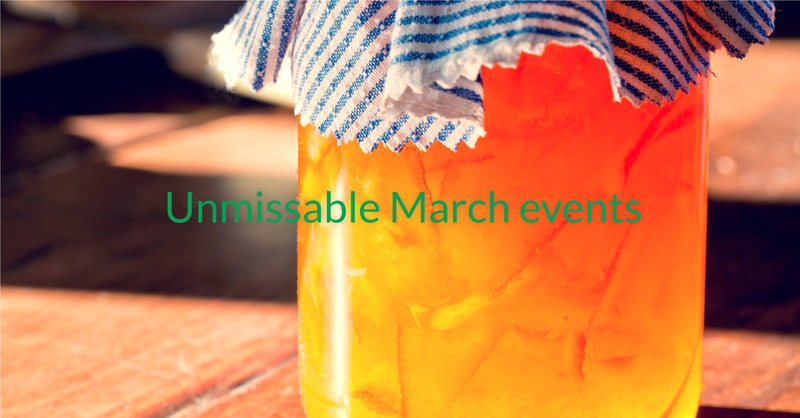 There is a marmalade festival – the world’s original marmalade festival – and the event takes place in Cumbria every March. Royal Mail must wonder what’s going on as it handles parcels of pots of marmalade arriving from the world over to a judging panel in the Lake District. The town of Penrith, which ‘turns orange’ for the event, is descended upon by marmalade connoisseurs from around the world and the awards ceremony is held at Dalemain Mansion nearby. Taste and buy the orange sticky stuff ‘til your heart’s content while you’re entertained by live music and performances that even Paddington Bear would enjoy. Storming into its fifth year, this event is now spread over two weekends. Celebrating the best of children’s literature the programme meanders school sessions and public activities in English and Welsh. For any child, whether they love or struggle with reading, the experience of hearing and seeing an author bring their stories and characters to life, in person, puts a whole new perspective on a tale. Check your diaries and put Cardiff in for at least one of these weekends! Get the inside track on one of Devon’s most spectacular National Trust properties. Welcoming visitors since 1935, this is a tour of how the public have experienced A La Ronde over the last 82 years. Quirky seems a rather underwhelming word to describe A La Ronde – it’s a 16-sided (hexadecagonal) building created by the Parminter sisters in 1796. Perhaps its most famous attribute is the shell gallery that’s adorned with an estimated 25,000 seashells from the local shores. It’s your last chance to explore protected woodlands and historic grounds after dark – at least for a few months. This is an event for the adventurous runner, who’s happy padding around whilst wearing a head torch (much prefer sunrise runs myself!). March events take place at Wimpole in Cambridgeshire and Attingham in Shropshire. While not exactly about longer days, get yourself booked in today for a rather unique fitness experience! And that’s a wrap for March – sorry not a lambing event in site – enjoy the daffs and keep your eyes peeled for bluebells. Roll on daylight savings!